The Colors Of Sea Glass - Where Do They Come From? 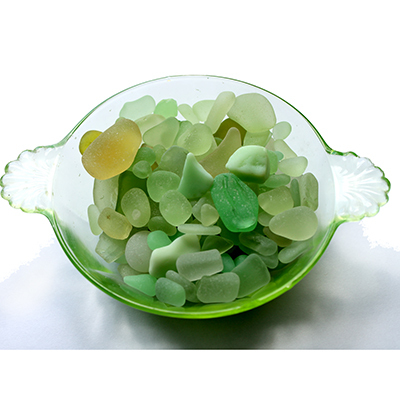 If you think about it, the common colors of sea glass, Green, Brown & White are still in wide use today......Rarer colors of seaglass are pieces that the color has not been made or used commercially for many years. We have broken the colors into rarity categories, it is a general rule and not to be carved in stone (or glass!) as certain colors can be found more readily in some areas. For Example, lavender glass can be a rarity in areas yet abundant in Maine & Canada but hardly ever found in the islands. Next time you're in an antique shop or flea market, look at the glass items and see if you haven't found a piece of glass this color! We have started to try and document as MANY colors as we can, specially in our larger pieces like pendants by showing a Macro Detail of the EXACT piece you are purchasing. Like a Diamond, this certifies your piece for posterity! See our List Of colors and please understand that naming colors is subjective and there is not official recognized source for all sea glass in the world. 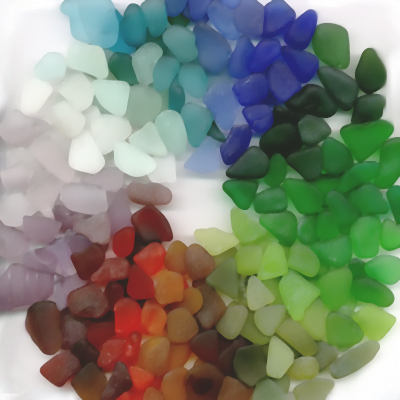 in just about every color of sea glass in the world! This glass knowledge is based on 28 years of collecting and decades of researching the origins of our glass. Common - White, Green, Brown found in most beach combing locations throughout the world. Unique colors are Greens Browns and Whites glass with age, thickness or patterning. Unique - Olive greens, pale amber's. Treasure Chest Colors - Those pieces of glass that are so unique and usually maintain a pattern or shape of the original source (i.e. 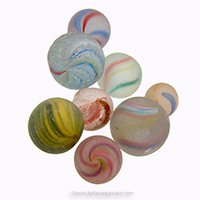 bottle stoppers, marbles, embossed glass pieces, pattern glass, old glass tiles, bonfire glass, mutli colored glass). 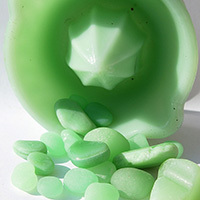 Green sea glass is a WIDE range of shades and hues. Heineken bottles, Rolling Rock, and lots of red wines come in green bottles still today. There is a wide variation of green though and common green generally refers to a Kelly Green. 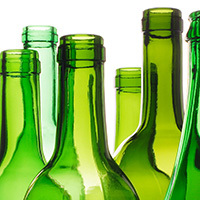 Older green glass could be considered Unique if bubbled or patterned, embossed or textured. Brown glass is also an old and new color. Budweiser beer and lots of others come in a brown bottle, yet old Clorox and Lysol bottles were brown and are old. (Yes kids, Clorox did used to come in a glass bottle as did everything else!) They still bear imprinting on some of the brown sea glass pieces. These colors are not in wide use today so there is no new source for them. Many of them were used commercially in the past. 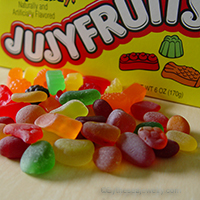 Before the 1960's plastic was not widely commercially used. Glass was the main way to preserve and transport goods. 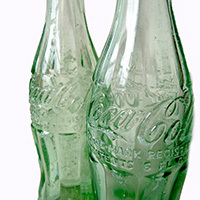 From home kitchens that "canned' in glass jars to sodas and just about every household product sold came in glass. Tin was also used but in coastal communities, tin would rust easy so glass was preferred. While the most common source for this lovely shade of light green glass was most likely an old Coco Cola bottle made in various parts of the country. The shades vary depending on the silica that was used. Cobalt Blue (Noxzema, Milk of Magnesia, Bromo, Evening In Paris, Vick's Vapor Rub, Poisons Bottles, etc.) There were many items made for this blue glass. 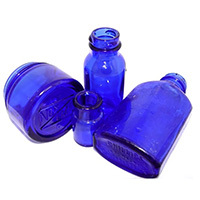 Many medicines and even poisons were bottled in cobalt blue glass. The magical like quality of blue glass is why it was used for medicine and why you still get that thrill finding one. 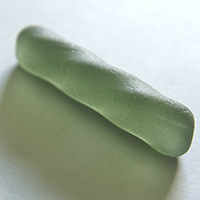 Among the most desirable of sea glass colors considered lucky as it is very lucky to find one now. Lavender (Could be any bottle, jar or glass product made with manganese). I find quite a lot of lavender and this glass has a neat history. 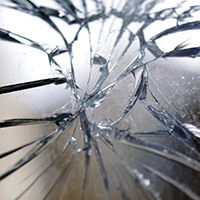 Glass in its raw state usually has a greenish tint to it, to make glass white or clear, a bleaching chemical agent was added. 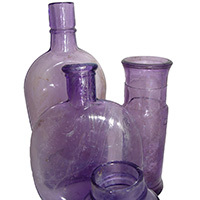 When W.W.I broke out the chemical could no longer be used and the replacement chemical that was used turned glass lavender over a period of time. It's kind of neat to think when you find a piece of this color, you can date it! Lavender glass is abundant in some areas and nonexistent in others. True purple glass is much rarer. In our English Sea Glass collection, it averages one in 5000 pieces as true lavender glass was reserved for the Monarchy (showing Royalty) and for the Bishops in the church. 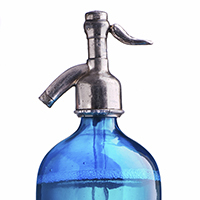 Light blue was used before printed labels were adhered to bottles. Made with the same cobalt chemical as the darker glass. 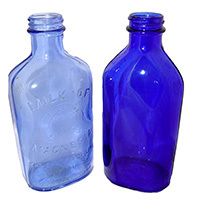 The product name was embossed on the glass (pictured left cornflower or light blue Milk Of Magnesia bottle) and this was easier to read on a lighter color glass. When printed labels started to appear, the color of the bottle went darker. Lime Green or Chartreuse Glass - Non UV Glass (A glass I have yet to find an exact original source - pictured here is a modern Blenko bottle). I believe that it may have been used in lemon lime soda bottles in the mid 1900's. 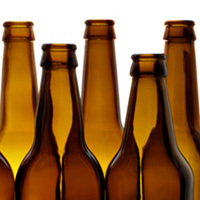 Beverages were bottled locally then so the color and abundance of glass is some areas could be attributed to this. 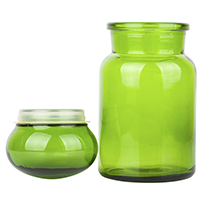 Most lime green glass is not thick so it indicates that it is a more relatively modern glass source, yet localized to certain areas. Very desirable this shade of glass on one of the rarest. Teal or turquoise is an older source. I have several old seltzer bottles from NYC that are this great shade. Deep aqua glass could have been a Ball canning jar or insulator used on electric poles in the early 1900's. Decorative glass like stained glass and house wares could also be a source. This sea glass is much more vivid than aqua sea glass! 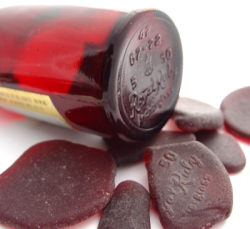 Red is the hope diamond of sea glass and will make any sea glass lovers week or year. One of the most common sources for ruby red glass was made by Anchor Hocking Glass Company for both decorative household items and in a 1950's Schlitz Beer bottle (bottle bottom pictured left here with sea glass pieces). There were vases, kitchen wares, railroad lanterns, Avon products and many more). 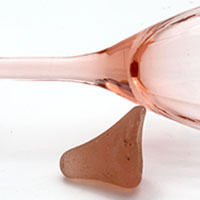 Anchor Hocking discovered a way to use copper to turn glass a red hue instead of the traditional gold, making the cost of producing this glass much more commercially feasible. I've been told there used to be a brewery on Long Island that made a beer called "Red Bottle Beer" and that you used to be able to find lots of red sea glass, this may have been where this beer was bottled. 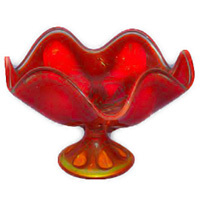 True Reds do in fact use gold to turn the molten glass its vivid red hue. This is why even today, red glass is very expensive. Other sources of red sea glass could have been running lights on boats (you know - red right return), taillights on cars that were dumped offshore to make reefs, or decorative household glass. Orange was also most likely from an old decorative household item. In the literal tons of sea glass I have personally collected, I have only ever been fortunate to get 5 pieces of orange. Orange could also have been warning lights on boats. These colors are most likely depression glass. 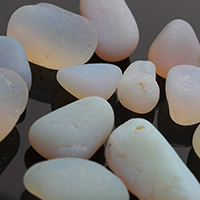 Not to be confused with a light lavender glass, pink sea glass is a soft pastel yellowy pink. Depression glass was widely used in house ware items (pictured to the right). Green depression glass (vaseline glass) and the rarer yellow depression glass are all great sea glass finds. 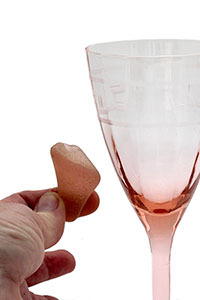 Though some refer to this glass as PINK, it is more accurately peach! 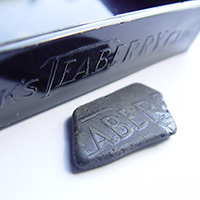 While there is no "true" black glass, this sea glass tends to be very thick and OLD! Black glass actually has a hint of another color, brown, green, red and other pigments exist. Because of the thickness and density of the glass, very little light passes through the glass making it appear black. Modern glass like Champagne bottles is a good example of modern "black glass"
Black sea glass is found more in Europe. 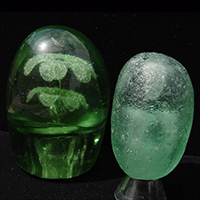 Jadeite sea glass is a semi opaque glass. Made famous and widely used in the mid 1900's by Fire King (and later made famous by Martha Stewart). Jadeite tableware was widely used in diners and is now heavily collected. 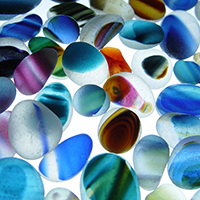 Opaque sea glass can be found in a variety of shades. Opaque glass is very dense and little light passes through it. A lot of these glasses were made by Fire King company in the mid 1900's mostly for household items (dishes etc..) but there were some commercial uses of the opaque white glass. I have a half of an old ball jar lid liner that is milk glass or porcelain lid liners for canning jars. Avon cosmetics also use a lot of white milk glass. 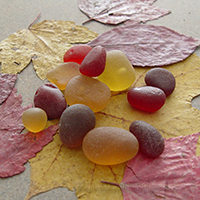 Opaque sea glass colors have a wide range including red, orange, yellow, blue etc. Milk glass contains dispersion of particles with refractive index significantly different from the glass matrix, which scatter light. 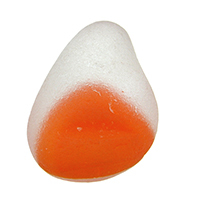 The size distribution and density of the particles control the overall effect, which may range from mild opalization to opaque white. Some glasses are somewhat more blue from the side, and somewhat red-orange in pass-through light. The opacifiers can be e.g. bone ash, or tin dioxide and arsenic and antimony compounds. What at first appears to be a simple seafoam piece of sea glass when exposed to black light, becomes an amazing glowing treasure. Made during the early 1900's and known widely as depression glass, UV or Ultra Violet glass was used in many housewares. Though jadeite's and pale green are the main sea glass colors that fluoresce, other colors will as well including reds, whites and lavenders. Inexpensive black lights are available online...WARNING, this can become addictive! It is fun to find these glowing beauties! This sea glass is, when you find it, a true treasure. 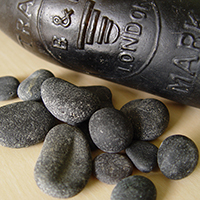 From old marbles used as ballast on sailing ships to frosted glass bottle stoppers this category is limited only to products made of glass. Glass doorknobs have been found as well as frosted Japanese fishing floats which are collected on the Pacific coastline. There are old pattern pieces that are flat and thin from old stained glass. One of my personal favorites is glass with markings. 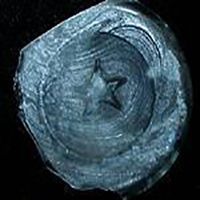 I think the passion of this type of sea glass comes from the root of sea glass mania for most people, that is, patterns or unique shapes in the glass give us an indication of the origin, that is was indeed a man made item recycled by nature to a lovely frosted artifact. I'd been interested in seeing pictures or hearing about your "RARE" color finds! Don't get discouraged if you have not found many of these colors. 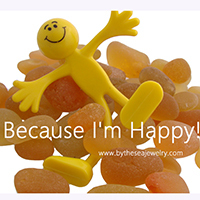 We have spent over 25 years and have a huge investment (over $100,000) in some of the rarest sea glass in the world. Our collection spans the world and many pieces can no longer be obtained. Pictured below, some of our ULTRA RARE sea glass pieces! More sea glass and beach found treasures coming SOON! Pink Sea Glass - Gray Sea Glass - Whimsies - Marbles AND MORE!